Ryan Coogler came up with the idea to reboot the Rocky series even before he impressed Sundance and Cannes with his hard-hitting debut, Fruitvale Station, which took the viewer through the final hours of Oscar Grant’s life. The Rocky films were a franchise Coogler felt an affinity with from a young age as he watched them with his father. 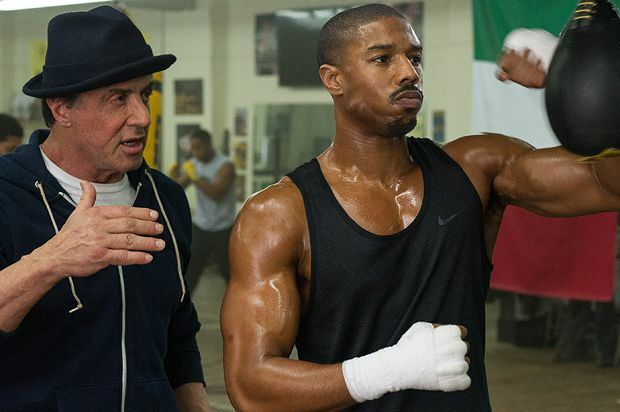 Creed sees the filmmaker collaborate once again with the indomitable Michael B Jordan and the pair rise up to the challenge of injecting heart, wit and personality into a stirring revival, which sees former star-of-the-show Sylvester Stallone step aside as Rocky Balboa becomes a coach and father figure. We meet the illegitimate son of deceased boxing legend Apollo Creed in 1998 as he engages in a fist fight with another boy at the Los Angeles juvenile centre where he resides. It’s a strong introduction that quickly establishes the mindset of our protagonist, Adonis (played initially by Alex Henderson), who has been left to fend for himself but is wise enough to know when to accept help, which arrives in the shape of Apollo’s wealthy widow Mary Anne (Phylicia Rashad). Fast-forward to 2015 and the adult Adonis (Jordan) is still fighting but this time in a boxing ring in Mexico, where he’s taking time out from his office job in LA. It’s not quite the same rags-to-riches narrative as Rocky but rather it extols the importance of carving out a life for yourself, on your own terms. Coogler takes great care in shaping his characters (Tessa Thompson as Bianca is more than a thinly drawn love interest for Adonis) and their evolving relationships, while also crafting a rich backdrop for their story to unfold upon. When Adonis eventually heads to Philadelphia to seek out Balboa and have a crack at making it as a pro boxer, the attention to detail in conveying the spirit and history of the city and the legacy of the Rocky films is breathtaking. Cinematographer Maryse Alberti does a superb job in partnership with Coogler in capturing the beauty of the run-down parts of Philly. They also create thrilling moments amidst factory buildings, including a scene where young men ride their quad bikes alongside Adonis during one of his training sessions. An incredible single-take boxing scene is another astonishing feat. From the perfectly judged poignancy to the beautifully choreographed and brutal bouts, Creed certainly goes the distance. General release from Fri 15 Jan.
Adonis (Jordan) is the illegitimate son of deceased boxing legend Apollo Creed, who acquires a coach and father figure in the shape of Rocky Balboa (oh come on, you know who). Coogler injects heart, wit and personality into a stirring revival, with beautifully choreographed fights and real poignancy.